If you love stained glass lamps as much as we do, check out this stunning stained glass lamp calendar for 2013, from the ASGLA (Assoc. of Stained Glass Lamp Artists): http://www.asgla.com/Calendar/2013/home/home.html We buy one every year, and they make great gifts, too! 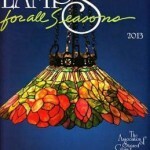 The ASGLA Stained Glass Lamp Calendar is Ready…and It’s Gorgeous!